After 34 years as one of the most successful juggling duos, The Raspyni Brothers are calling it quits. This will be their last public performance. World renowned juggling team the Raspyni Brothers will present their final public performance at the historic Nevada Theatre as part of the Nevada City LIVE! series on Friday, November 4. Barry Friedman and Daniel Holzman are the Raspyni Brothers. As one of the most sought-after acts on the corporate entertainment scene, they have appeared annually at over 100 events across America and internationally. 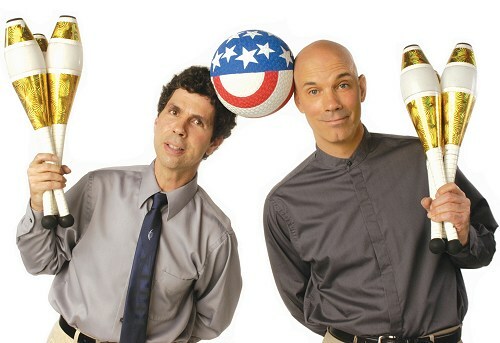 Since 1982, their intelligent mayhem has earned them two International Juggling Championships, multiple appearances on the Tonight Show with Johnny Carson and Jay Leno, and a place in the Guinness Book of World Records. In addition to the tremendous success they enjoy in the field of corporate entertainment, these two unrelated siblings also tour as an opening act for dozens of superstars such as Robin Williams, Billy Crystal, Tony Bennett, Dennis Miller, and Tom Jones. Other audiences have ranged from the King of Spain and the Academy Awards, to the sequestered O.J. Simpson jury. Barry Raspyni was born with, and still has, the heart of a child. Since his arrival on Income Tax Day in 1962, the taller Raspyni Brother has skyrocketed to an imposing 6′ 1″, while maintaining a very sleek 174 pounds. After extensive review of archive footage however, it is obvious that he looks both taller and heavier on television. Moments after bumping into Dan Raspyni at a park in 1981, Barry was jolted from his path of mediocrity and knew his future would be bright. The following summer he and Dan traveled the country performing a show that was made up as they went along. It was the time of his life. All these years later, it still is, but occasionally, Barry reflects on what might have been: pizza chef, forklift driver, or perhaps computer repair technician. In a perfect example of just how unregulated the position of Legal Parent is in our country, Barry is a father of one boy, Zed, who was born in April of 2002. And, in a perfect example of just how tolerant, patient, and understanding the female species can be, he has been married to the same woman since October of 1987. He is domestic, yet international. Recently, during a single week, he had breakfast on the Champs Elysees on Wednesday, and was raking his yard on Friday. He is a commercial pilot, can communicate in Morse code at upwards of 35 words per minute, and converted his VW Westfalia to a real vehicle by single-handedly outfitting it with a Subaru engine. His intent is to never fully grow up. Dan Raspyni was born in 1961 by Immaculate Conception (at least that’s what his mother says). His formative years were spent in the culturally deprived paradise that was California’s San Fernando Valley in the 1970s. Wanting the easy money and warped reality enjoyed by child movie stars, he began taking speech and acting classes. At age eleven, he landed a supporting role in the cult horror classic, It’s Alive. After graduating from high school in 1978, he applied to the school of hard knocks, but was rejected because he had too much money. In 1980 he set out on a quest to find the long lost brother he never had. After years of searching high and low, he started looking in the middle. It wasn’t long before he located his unrelated sibling, Barry Raspyni, and the rest is history (or to be more accurate, their story). Dan Raspyni enjoys tournament-level ping pong, internet poker, watching movies, and eating bland foods that are low on the glycemic index. An avid reader of high-brow literature, it’s not unusual for him to read two celebrity tabloids in a single day. Dan lives in San Francisco with his lovely wife Karen, their two pets, and a house full of furniture. » Even though Barry and Dan have worked together for over twenty years, they have never actually touched. » In addition to his skills as a juggler, Dan is also very good at throwing objects up in the air and catching them again. » When he travels internationally, Dan’s code name is “The Jackal”, and though his head is much larger than the passport photo he uses to identify himself, he has never been stopped by customs. » Dan’s pants size is 32″ waist, 32″ length. This makes him, by definition, a perfect square. » Pushing the envelope and drawing outside the lines are two ways Dan and Barry stay original and avoid sounding cliche. 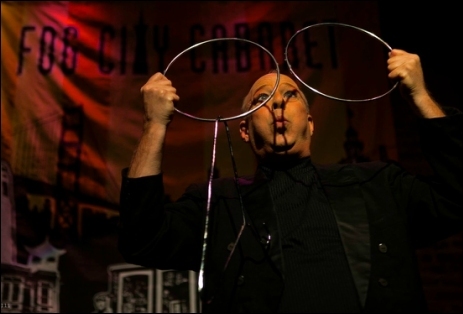 Voted #1 Street Performer in San Francisco, Ken Sonkin delivers a show that is a fast moving combination of physical comedy, magic, dance and juggling all choreographed to music. His high energy elevates audience participation to a new art form. A modern-day Harpo Marx! He has appeared in concert with Jay Leno, Ellen DeGeneres, Red Skelton, Howie Mandel, Paula Poundstone, The Manhattan Transfer, The Drifters, Donnie & Marie, Waylon Jennings, entertained in Las Vegas at The Bellagio, Caesar’s Palace, and The MGM Grand, been on The Late Show, PBS, A & E’s Comedy On The Road, headlined at The Ice House, The Comedy and Magic Club (Hermosa Beach), The Punchline, The Improv, Hollywood’s Magic Castle, and performed for Queen Elizabeth II of England!! Hayley Pritchard was born in the Bay Area and is so thankful her parents moved to Nevada County to raise her in this rustic community. She is now a graduate of Nevada Union High School and is attending Portland State University in pursuant of a degree in Health Education and Business. You may have seen her performing around Nevada County or maybe in the 2016 Dancing with our Stars! 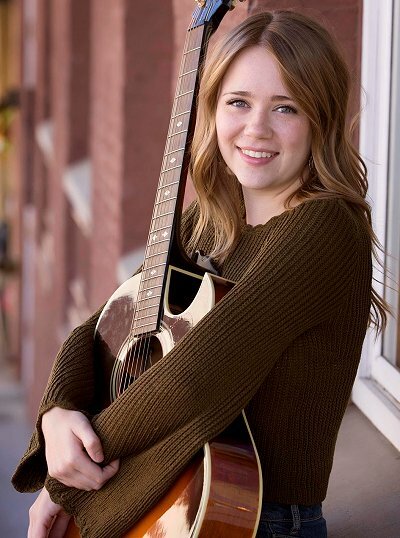 She has taken music lessons for the past seven years and loves to perform. Her folksy songwriting style is very relatable. She writes about important events and uses music to help her process the changes in her life. She has not let Portland or crazy college all-nighters get in the way of her music or her love of Nevada County. She is so happy to be home to open this historic show!